While some might think the most wonderful time of the year is the holiday season, we at the Clog believe the most wonderful time of the year is Girl Scout cookie season. 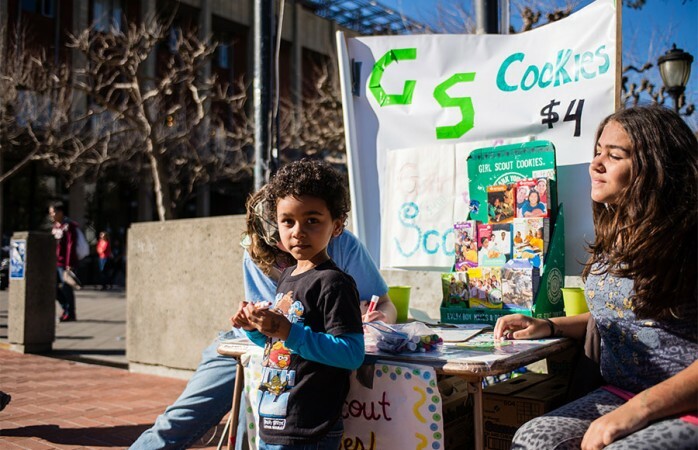 Luckily for all of us here in Berkeley, the Girl Scouts are back in action as of this week at North Gate and the corner of Bancroft and Telegraph, and they take cards. Now that we’ve all got cookies on our minds, it’s time to reveal the truth. Which Girl Scout cookie are you? How many cookies do you eat in one sitting? I have one with my 2 p.m. cup of coffee before leaving the house with enough time to get the front and center seat in my afternoon class. I typically eat four or five before I cut myself off. Any more than that would make me sick. I usually eat a whole box as soon as I open it, but it’s because I share them with my entire dorm floor. These cookies were made for sharing. I’ve been known to demolish the entire box on several occasions. What drink goes best with a Girl Scout cookie? Black tea with a dash of milk and sugar is the best choice. I prefer a big glass of milk. A cold, tall glass of lemonade is the perfect pairing. I like a warm mug of hot chocolate for dipping my cookies. Where’s your favorite place to study? Sacks on College Ave. is the place for me. I’m there every Saturday and Sunday afternoon, surrounded by piles of books. I usually study in my bed. It’s much easier to nap in between reading chapters of the textbook. I like that the East Asian Library’s natural light and private cubbies help me focus, without making me feel too trapped. You can usually find me somewhere underground between Doe and Moffitt smuggling snacks and coffee to keep myself awake. I’ll usually go to San Francisco and check out the outdoor markets and cafes. Well, if it’s before 2 p.m. I’m definitely not awake. I like to sleep by day and party by night. I like to work out in the mornings, take a shower and go get brunch with my friends. A spontaneous weekend is the best kind of weekend. I love going to concerts and art gallery openings. If you had to take all your classes in one campus building, which would it be? Wheeler Hall — it’s centrally located on campus and has both a big lecture hall and plenty of smaller rooms for good discussions. The Valley Life Sciences Building is my favorite place to spend the day. There’s a lot of variety in the classrooms, and what could be better than a Micro Yali’s? I actually like Dwinelle because of how confusing it is to find a classroom. It makes going to class every day an adventure. I’m a big fan of North Gate. Even though it’s always hot, the wood paneling in the lecture hall makes it look fancy, and the courtyard is a great place to eat lunch. You’re a box of Savannah Smiles. Just like these cookies, you’re incredibly zesty. You give off a powerful first impression that’s topped off with a dose of your sugary personality. You’re high-energy and classy, so it’s easy for you to find the balance between coming off to strong and not being strong enough. You’re a box of Tagalongs. You’re a lot of classics all rolled into one awesome human being. Just like the cookie, you’ve got a solid core and a big heart. You’ve got a zany side and can even be a bit nutty, though you’re a total crowd-pleaser. You always carry an extra bar of chocolate around to share with someone in need. You’re a box of Samoas. You’re super sweet and also exotic, keeping everyone you know on their toes. You love to bake classics using shortbread and chocolate, and you’ve gotten really into the trend of coconut oil. You’re a box of Thin Mints. Just like these cookies, you’re everyone’s favorite. When your friends don’t know what to do on the weekend, they turn to you. You having enriching conversations and think everything’s better when it’s covered in chocolate.